Finding ticks has become a common occurrence here in the Ottawa area in recent years and has increased the chance of contracting tick-borne diseases. We cannot eliminate the risk of ever having a tick on our pet but we can do several things to reduce that risk. The most common tick we see here in Ottawa is the deer tick (Ixodes scapularis) and it frequently carries Lyme disease (Lyme borreliosis). Ticks become active when the temperatures are above 4 degrees Celsius. In the past we found that treatment April to November was sufficient but as our temperatures rise we now recommend year round preventative treatment. There have been many days in January and February where the temperatures have been at 4 degrees and even warmer. The ticks are active and hungry on those days and are searching for a meal. Several products are available to protect your pet. They can be applied topically or given orally. Protecting your dog and/or cat also means protecting yourself from ticks. Our pets often sleep in our beds and on our couches. If your pet has a tick, there is potential for it to fall off and then attach to us. Tick-borne diseases can be a problem for our pets but are much more serious for people. Checking your pet regularly for ticks is important. If you find a tick on your pet, you can call your veterinarian and arrange an appointment with a veterinary technician to have it removed. If you are comfortable removing it yourself you can go ahead and do so. The best tool that we have found to remove a tick completely is a Tick Twister. It breaks the bond that the mouth has with the skin so that the entire tick can be removed. If you find a tick on your pet, let your veterinarian’s office know. 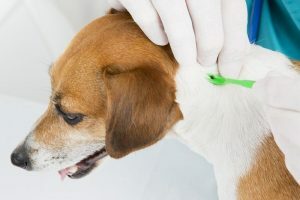 Bloodwork can be done to determine if your pet has been exposed to the bacteria that causes Lyme disease and several other tick-borne diseases. If you find one on yourself, keep the tick and consult your physician.